A quality mini classical travel guitar. Now, can we get a cutaway electro version? Compact yet quality build. Near full-size neck. Sounds great as a guitar accompaniment. Uke-like tonality of the A to A tuning may deter some. You don't need to be a guitar enthusiast to see the current and still-building popularity in small guitars. Some might have four strings - ukes, tenors, cavaquinhos and the like - but many, helped by Ed Sheeran, Taylor Swift et al, have six. It seems like the 'mini' guitar is becoming just as 'in' as the nano-sized pedal phenomenon. We recently looked at USA-brand Cordoba's uke-meets-classical six-string Guilele, and earlier this year the company took the wraps off of the Mini in three acoustic-only solid top/ laminate back and sides versions: spruce/mahogany (Mini M, £167), spruce/ rosewood (Mini R, £208), and, here, ovangkol. "When it's up-tuned as designed, it also makes a great accompaniment to a standard- tuned guitar"
While the Guilele has a 435mm (17.125- inch) scale length and nut/ saddle widths of 46mm/50mm (pretty cramped, in other words), the Mini shoots with a longer 510mm (20-inch) scale and nut/saddle widths of 50mm/63mm. With that comes a larger, non-cutaway body, mahogany neck, and flat classic- style rosewood fingerboard - the neck joins the body at the 14th fret, not the classical position of the 12th. Equally unusual is the use of a steel-string like pin bridge, rather than classic style tie- block bridge that requires you to knot the end of the string before fitting. You could use nylon strings with bullet ends, but that's not commonplace. Incidentally, the Mini comes factory fitted with Aquila 96C strings featuring 'Nylgut' trebles, a white synthetic gut. Cordoba's Chinese build quality is pin-sharp and this lil' Mini is no different, not least the understanding of a classical style neck shape - 'U' shaped, intended for thumb-behind classical-style positions. The thin matt finish is beautifully applied, too. The black bound edges are left rather sharp and the bone saddle leans forward slightly, but it's not only well- crafted but good looking, too. While the Mini can be tuned to standard pitch, on a scale that's so reduced from the typical classical scale of 650mm (25.6 inches), things are relatively floppy but far from unplayable. In the factory-designed A to A tuning, however, things feel remarkably classical-like, and the wider spacing makes it surprisingly easy to fret. There's reasonable projection, too, but it's as a practice tool or even a songwriting partner that the Mini feels a lot more 'serious' than many smaller instruments. Of the three Minis, the O veers on the uke side, with more 'plunk' to the tonality, while the spruce-topped R and M give a more classical voice, which we suspect would record rather nicely, too, especially with these Aquila strings. It's not the most compact 'travel' guitar out there, but it is a more-than-usable practice instrument tuned to standard pitch, thanks to the near full-size neck width and string spacing. 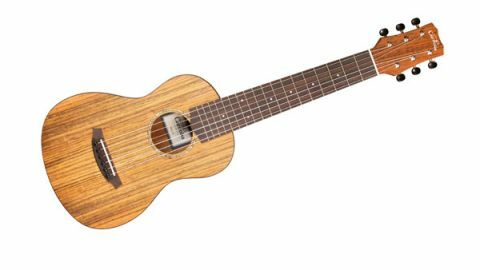 When it's up-tuned as designed, it also makes a great accompaniment to a standard- tuned guitar, albeit veering into the uke tonality - which could be a good or bad thing depending on your taste.